This past week, M tried on a hand-me-down dress for my friend's upcoming wedding. This dress is NOT just any hand-me-down. I fell in love with this dress when I was searching out the perfect flower girl dresses for my nieces to wear six years ago. 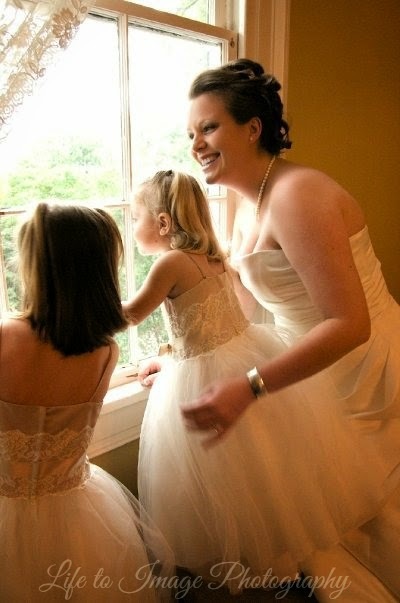 Me with my beautiful flower girls- August 2008. As I am sure you can imagine, M would not take this dress off. 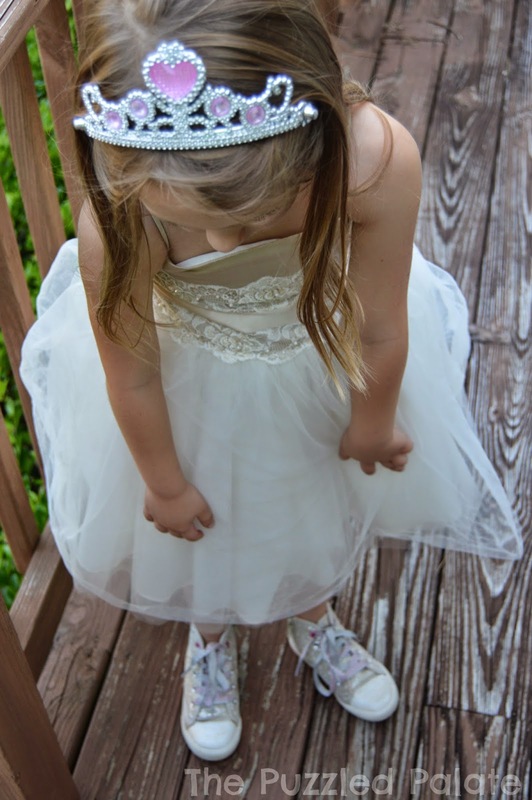 She went off to accessorize with a crown and her special shoes. She then proceeded to wear it around the house all day. She kept trying to catch a glimpse of herself in the mirror and would twirl around the living room- so precious! High tops are the new glass slippers, right? When in a princess dress, one MUST curtsy! Look at those beautiful eyes! This picture takes my breath away! I love that she loves this dress as much as I do and I can't wait for her to show it off at the wedding! Please leave a comment and tell me that I am not the only sentimental fool out there! Cute pics - M looks beautiful in the dress. Such wonderful memories this dress is giving you. M looks totally adorable in that dress.No you are not the only sentimental one lol. So cute and adorable. Love the dresses. She looks so beautiful. That last photo is killer! And the silver high tops are perfect! I have butterflies when I see her eyes like that - the last photo shows a side of her that I would love to encourage! Wonderful pictures!!! 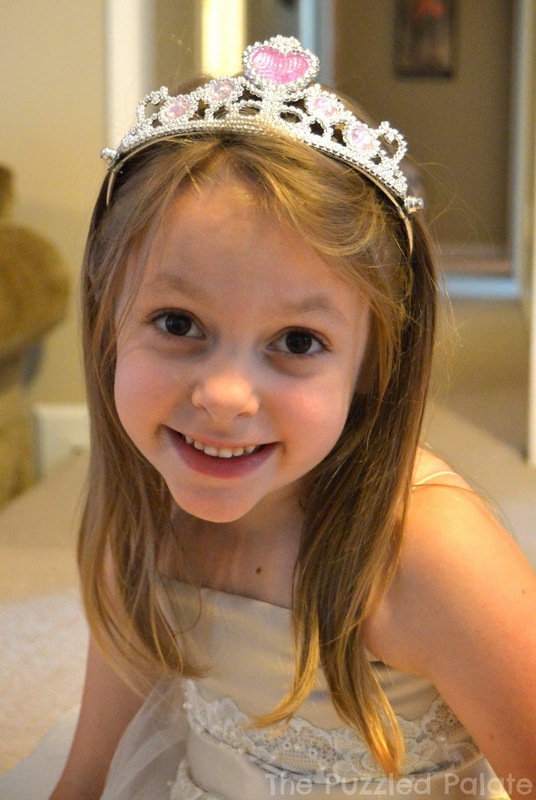 I cannot wait for my little one to be old enough to play princess and dress up. These pics are too adorable! I STILL love playing hopscotch, so I guess I really loved it as a child. I have a huge soft spot for it. Yay hopscotch! I love sidewalk chalk. Cute pics, thanks for sharing! I've never heard of the chef card, but I can't even express how brilliant that is to have available. My daughter was vegan for a while so this would have been soooooo helpful. She is adorable in that dress! Love the high tops. My kids are older, but they still love to play with sidewalk chalk. Heck, even I like to go out and use it from time to time with them lol. They are adorable! Those those cute High-tops! I have never heard of the chef card but it's such a smart idea. Allergies should not take the fun out of travelling! What a beautiful dress! I can also see why that picture takes your breath away! She's a sweetheart! Love that beautiful face!! That eye contact is absolutely amazing. Sparkly high tops are absolutely the modern day girls glass slippers!! I didn't realize there were apps that would help you with eating with food allergies while on the road. These are definitely some great tips! Yes, I love the hightops! These pictures are great, your girls are adorable. Thank you for sharing this story! Ha, ha! I love "chalk therapy sessions." Those would be the best kind, even for adults. Chalk is so much fun and such a great educational tool while still being really cost effective when it comes to toys and entertainment. aw such a cutie. she looks very pretty just like a true princess. That is such a cute dress. She looks adorable! She's going to sparkle on the wedding day. I love that it made her feel so wonderful! Oh how cute. The dresses are beautiful. You will all look stunning. She is absolutely darling and she is going to rock that dress at that wedding. Thanks for sharing your photos with us. She looks like a little princess! Great pics, she looks so happy! I had no idea there was an app to help those traveling with food allergies! Old school fun stuff here. :) Kids today don't usually go out and enjoy chalk and sidewalk games like we used to. Glad you're ensuring your kids do! My daughter used to love playing with sidewalk chalk. Although she doesn't play with it as much anymore, she is getting ready to paint a chalk board wall in her room! That is a really pretty dress! She looks absolutely adorbs in it! Those hightops are totally the coolest. I want a pair for me!! Those are some gorgeous dresses - they're the something borrowed! These are great ideas! A few weeks ago my daughter, Amber, went to the beach with a friend's family. One of the people she went with had a severe shell fish allergy. Since they were at the beach, they had to be very careful about where they ate! Great post. I recently did a sidewalk chalk post to. Its so versatile and can be used to help improve so many areas of a young child's life. These are some great tips. It seems the older I get, the more allergies I get. Or they get worse, like my milk allergy. Oh, I love this. Such sweet pictures. OMGosh the dress is beautiful and she's adorable in it! LOVE the high tops for sure! Such great tips! Luckily we don't have any allergies but we have friends with kids that do! She looks so pretty in that dress! And I love her shoes! What a beautiful dress. Glad she liked it so much!! It is a really beautiful dress and I love how she accessorized it with a tiara. Wearing dresses like that one make you feel like a princess. Oh this is too cute. I love how it is being traveled between family. Oh I love these tips! I'm going to go download the Find Me GF app and the Allergy Eats app now so that I have them when my friends and I go on road trips! 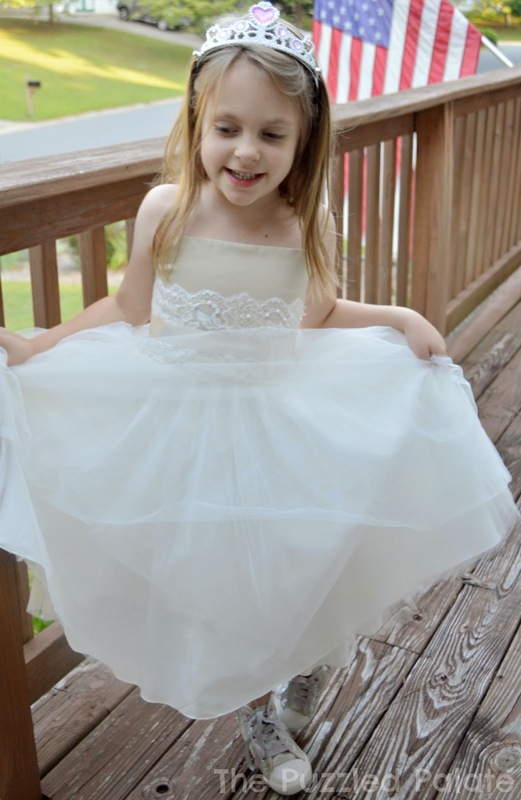 What a gorgeous dress and beautiful little girl. Thanks for sharing this fun story and pretty pics! It sure is a gorgeous dress! My girls wouldn't take it off either! That is gorgeous and she is so pretty in it. What a little fashionista with her sneakers on! OH! It's a beautiful dress, and she is GORGEOUS! You'll make more sweet memories to add to the ones you already have! what a beautiful dress she's wearing. I love that she has her high tops on in the pics. It really is a gorgeous dress! I love the princess curtsy photo most of all! These are great tips! Luckily it's not something we have to worry about, but it's a very real issue for many people. My oldest is almost ten and he still loves it, too!